From what I remember of Bane, he is pretty clearly Hispanic. I'm not sure to what extent this is implied or explicitly stated. He grew up in a Spanish speaking country, Santa Prisca, in a Spanish speaking prison. His mother was a native from Santa Prisca and was Hispanic. He called his childhood Teddy Osito, a Spanish word. He had a physical appearance in line with Hispanic people. In cartoons, he had a Hispanic accent. One of the things I have noticed about The Dark Knight Rises is people being upset that Bane is no longer Hispanic. I have to admit this bothered me as well. However a colleague of mine didn't accept that Bane was Hispanic, as he speaks English and had an English father. It seems pretty obvious to me that Bane is Hispanic but I suppose it is a matter of interpretation. Is there any firm evidence (preferably from a comic) that Bane is Hispanic? Well firstly, Bane was indeed raised in Santa Prisca, however he was raised within the Pena Duro prison there with his father. That implies that they were there, but not necessarily natives. I imagine that growing up there would help him learn the language regardless of ethnicity. Secondly, Bane's father was King Snake, AKA Sir Edmund Dorrance. He was most definitely English, not Hispanic. It is possible that Bane's mother was Hispanic, but that is never alluded to. Bane definitely uses Spanish phrases, such as calling Dr. Penelope Young "the Bruja" (Spanish for witch) in the Arkham Asylum video game. It's been many years since I read the Vengeance of Bane and the Knightfall story arc, but I seem to recall several other times when his language suggested an Hispanic origin (or at least a strong familiarity). First, it is worth noting that TDKR diverges from the comics canon. In the comics, Bane did not protect Talia al Ghul in the prison. She encounters him first on a mission in Batman:Birth of the Demon (1992). So, that is enough to make the point that Bane in TDKR does not follow comics continuity or canon. I think the evidence suggests that Bane may not be Hispanic. Not only do we know (A) his father was English (King Snake, aka Edmund Dorrance), but in the comics (B) Bane presumed for a while that Thomas Wayne was his father and that he and Bruce were brothers. The priest in Santa Prisca tells him that his father may have been an American doctor, and then in Gotham Knights 33-36, he is DNA tested. Although he and Bruce discover that Thomas Wayne was not his father, I think we at least learn that both felt it was credible enough that his father was a Caucasian male. HOWEVER, that does not rule out that his mother was Hispanic. BUT, you may be able to shoot down your friend's argument about Bane speaking English. Wikipedia has the line, "He knows six active languages and at least two additional arcane and dead ones. Among these are Spanish, English, Persian, and Latin." This is partially due this photographic memory revealed in the "Bane of the Demon" storyline. And finally, Bane's Spanish figures of speech are not helpful in determining his ethnicity since he knows so many languages and since he was raised in a (fictional) Caribbean nation in a prison. All that said, when I read stories with Bane in them, I hear a Hispanic accent and think of the character as Hispanic for some reason. He is clearly more of a Hispanic figure in the comics than he was in the movie, and it's fair to ask, "why?" IMHO. If anyone's seen the 90's "Batman: The Animated Series" cartoons (they're on Amazon video now) Bane is clearly using words that would lead one to believe he's hispanic. "Bruja" is a good example of this. Furthermore, Bane wore a mask that looked a lot like a Mexican wrestler's mask. 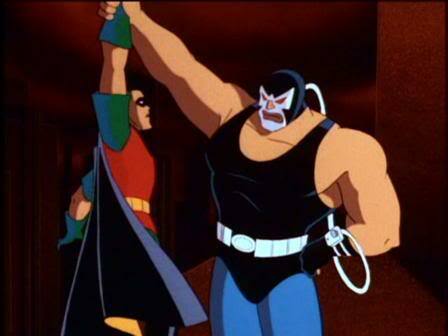 As a kid, I always just assumed Bane was a Mexican wrestler sort of villain. I guess it's all open to interpretation now, since there's been so many writers and adaptations to DC characters over the years. Not the answer you're looking for? Browse other questions tagged dc bane or ask your own question. Is there any sun-color that gives humans “Kryptonian” powers? When do Batman and Bane first fight? Is there any evidence that Barry's time traveling affects Star City?